The fantasy football Season is upon us and our team here at The Sports Script wants to make sure you are completely prepared for your draft! Our football staff will be periodically releasing questions and answers to burning questions that the readers have at each position. Our uber-talented team of writers has you covered! Today we start with quarterback. Buckle up! 1. Will anyone dethrone Peyton Manning as the #1 fantasy option at the position in 2014? Gallimore: Peyton had the season to end all seasons last year. You cannot expect that to happen again so I think he falls from the top spot but should be firmly entrenched in the top 3. Moore: Yes and his name is Drew Brees. The Saints lack of a pure run game, posses a good trio of receivers and employ the best tight end on the planet. Oh, and their offensive line is improved, too. New Orleans’ offense relies on Brees throwing the ball a lot and those back-to-back 5,000 yard seasons will continue to be a trend. Hines: Peyton Manning put together the most impressive season I have ever seen a QB have last year. Replacing Eric Decker with Emmanuel Sanders shouldn’t affect him much. That being said, we have to think some regression is coming, but is it enough to fall below Rodgers and Brees? I don’t see it happening, especially with their schedule. Valero: Manning’s ’13 was absurd but I think the biggest thing that will hold him back from repeating will be Denver’s schedule. With matchups against the NFC West, Jets, Patriots and Bengals, it’s not going to be a cake walk. 2. Cam Newton has finished amongst the top QBs each season since he has been in the league. With the lack of weapons around him does he finish in the top 5 this year? Gallimore: Newton has had a lack of weapons his whole career and it hasn’t slowed him down because of his running ability and goal line work. He may have lost Steve Smith but you could argue that overall his weapons could be better than last year. With that said I think some other QB surpass him this year. Top 10 finish but not top 5. Moore: No, but he will be a top 10 option. He lost 4/5 of his offensive line, and his receivers are made up of a bunch of average veterans and an over-hyped rookie. His only good target is Greg Olsen but that won’t be enough. Cam will be up to his running tricks, but it won’t be enough to get him into the top QB 5. Hines: Greg Olsen, Jason Avant, Jericho Cotchery, Kelvin Benjamin, and Tiquan Underwood make up the current receiving core for Cam Newton. We know Olsen can play, but can Benjamin make an impact right out of Florida State? Can he still be the duel threat just four months after ankle surgery? You won’t see me drafting Cam based on his ADP this season. Valero: I think Newton will finish among the top five again. Newton has all the tools in the world and will use them to make plays. I think he could record double-digit rushing scores to go along with nearly 20 passing TD. I am all-in on Newton proving the doubters wrong. 3. Who is your biggest sleeper at the position? Gallimore: I am not sure if he qualifies as a sleeper but I expect a huge year from Jay Cutler. He has an improved line, possibly the best 1-2 WR punch in the league, and another year with Trestman. 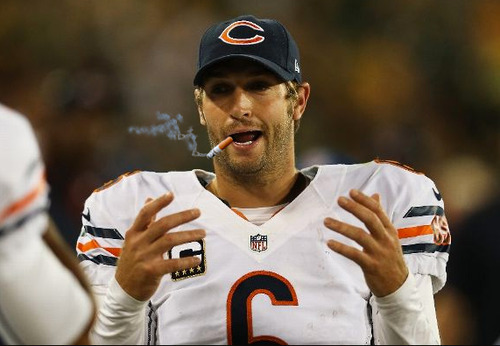 I put Cutler in the top 5 QB’s this year at a bargain price. Moore: Tony Romo. Everyone knows from reading my QB rankings that I’m big on him coming into the season. He’s got a pass-friendly OC, a boat load of weapons and a solid offensive line. Despite his health concerns he has only missed 1 game in the past 3 seasons. He gets no love, but will wind up finishing in the top 5 at his position. Hines: He is a household name but is not someone that many people are looking to draft in fantasy this year. Tom Brady had an off year in 2013 after losing Gronkowski, Vereen and Amendola. Tom Terrific comes back in 2014 with a healthy core of wideouts and a chip on his shoulder. Brady has the highest ceiling of any of QB being outside the top 70. Valero: Josh McCown. Cheap plug, I professed my love for McCown in this article. He is going to have a ton of weapons down in Tampa and should take full advantage. Jackson, Evans, Dougie and Brandon Myers are going to make McCown a top 10 option this season. 4. Who will be the biggest bust? Gallimore: Nick Foles will be the biggest bust as his interception rate falls back to earth and the league has a full year of film on Philly’s offense. In leagues that punish for INT, don’t expect a repeat of last year. Right now he is the 6th QB off the board and I expect him to finish 15th for the year. Moore: Nick Foles, and not because he won’t be a good QB this season, but because he is being selected too early. He can’t maintain the TD to INT ratio he posted a season ago (27:2). He loses DeSean Jackson and the league has another season to adjust. He’s in my top 10, but barely. Hines: Back to my point on Cam Newton above; I think that he will be the biggest bust this season. He doesn’t have enough WR talent and I’m concerned about his running ability coming off injury. Cam is being drafted number 4 at the position behind only Manning, Brees, and Rodgers. Stay away, friends. Valero: RGIII. There is a lot of hype surrounding him this season and I honestly just don’t trust the guy. He needs to control his reckless style of play. There are safer options deeper in the draft that I would love to have over Griffin. 5. What is your strategy when drafting a QB? Gallimore: I am holding back and targeting Cutler as he is currently being taken in most drafts as the 14th QB. I expect a top 5 finish for him so getting him a round earlier than his ADP (96th pick) is still great value if he delivers as I expect. Moore: QB is deep this year and there are a lot of under-the-radar options. I’m not looking to draft my QB until the 5th round or later. Hines: When drafting a QB, I almost always wait until the later rounds to grab my guy. QB is deep this year, and while Cutler and Dalton don’t have as high of ceilings as the elite tier, I fill my other positions with raw talent and worry about QB later. I also never draft a backup QB because my bench is filled with RB and WR sleeper options. Bye week QB should be a waiver add. It is just one week, and I don’t want to have to choose between two QB every week. Draft one and have faith. Valero: WAIT WAIT WAIT AND WAIT LONGER. I treat the QB position in football as I do starting pitching in baseball. The position is so deep this year you will be able to play matchups. Don’t panic when the middle-round QB run is underway. Be patient. Make sure to follow Ricky, Jared, Shane and Doug on Twitter. The Sports Script is your one stop shop for fantasy football content throughout the season!